Aging Well (AW) recently spent time with James T. Pacala, MD, president of the American Geriatrics Society and an associate professor and associate head of the department of family medicine and community health at the University of Minnesota Medical School, to discuss some of the issues and concerns germane to healthcare providers in their treatment of older adults. AW: How can physicians increase their focus on preventive care rather than simply practicing reactive medicine? Pacala: It’s important to clarify what’s meant by preventive. There are different types of preventive care that are appropriate for different types of older patients. For example, if you have a healthy older patient, the types of preventive care you’re going to practice for that patient are going to be pretty similar to the types of care you practice for other age groups: promote good health behaviors, schedule cancer screenings, colonoscopies, mammograms. The kind of stuff we do for younger people as well. For older adults with chronic illnesses such as osteoporosis, diabetes, and coronary disease, those types of preventive activities are still important, but probably of equal or even more importance is to secondarily prevent an undesired manifestation of their chronic illness. For example, once there’s angina, it becomes statistically much more likely that coronary disease is going to cause problems in the future and threaten livelihood and quality of life than other types of illnesses. We need to take care of chronic illnesses and prevent bad manifestation of chronic illness. For people who are chronically ill, the idea of secondary prevention becomes much more important. There’s a great deal of diversity among older adults related to their health and functional status. They’re by far the most diverse segment of the population in terms of their health. You have healthy old people, chronically ill old people, and frail or what we call multimorbid old people. These are people who have multiple advanced chronic illnesses—a functional health stage in which what we’re really trying to do is prevent functional decline and what we call geriatric syndromes. If people acquire enough geriatric syndromes, what happens is they reach a new type of functional state called frail or multimorbid state. At that point, the likelihood that medical care is going to cause another problem is much more likely than for a younger person. In doing all the things for chronic illness that are appropriate—for example, multiple medications, seeing multiple doctors—care is often uncoordinated. The patient ends up doing worse because of all that care. At that point, the preventive focus shifts toward trying to prevent discordant care, polypharmacy, and repeated admissions to the hospital because of complications from competing therapies for different conditions. Practitioners need to recognize where their patients lie in terms of their health and functional status. For healthy and functional older adults, you apply many of the standard preventive familiar activities: exercise, diet, cancer screenings, blood pressure checks, etc. When patients develop chronic illnesses, prevention involves limiting bad things occurring due to chronic illness. If patients develop enough chronic illnesses and they become frail or multimorbid, practitioners need to recognize that state and must become more concerned about preventing polypharmacy, falls from complications resulting from various treatments, confusion, and delirium due to multiple competing therapies resulting from uncoordinated care from a group of providers. There are certain preventive strategies regardless of patients’ health status. Immunizations are always important. Getting a flu shot is important whether you’re healthy, chronically ill, or frail. It’s just a good idea. Healthcare professionals need to monitor whether patients are depressed, whether they’re doing things to maintain a good mental outlook and prevent psychosocial problems. Suggesting some type of physical activity, even in frailty, is probably a good idea. If a frail adult has five different chronic illnesses, is taking 15 medications, and has difficulty with activities of daily living, one of the last things on your mind should be whether that patient’s mammograms or their colon screenings are up-to-date. AW: How can physicians become more effective in combating adverse drug events in older adults? Pacala: Several ways have been shown to be effective in reducing adverse drug events. Awareness is certainly important. For a patient with more than four prescription medications, the possibility of an adverse drug event begins to go up very steeply. That should trigger a voice in the back of a physician’s mind; when you get to four or six medications, you’ve got to start really paying attention. One provider should prescribe all the medications for a patient. Many patients have multiple doctors who may prescribe medications. Each specialist focuses on one organ system and is not looking at the whole patient as a geriatrician or a primary care physician does. Having that geriatrician or primary care physician do all the prescribing helps to coordinate care when you have someone who is looking at all of a patient’s medications. A geriatrician or primary care physician can contact specialists and report that he will do all the prescribing. If the specialist wants to make a change in medications, he can contact the geriatrician or primary care physician and make the recommendation. Specialists, I have found, are very receptive to that. That, for me, hasn’t been a big deal. Most of the time they’re [specialists] very receptive and supportive of that approach. It’s very helpful to have a consulting pharmacist in your practice or to have one accessible. Studies show they’re effective. In consulting with physicians, consulting pharmacists can make recommendations and reduce adverse drug events. Use electronic prescribing. It can greatly facilitate coordination, and it can lead to more accurate prescribing and avoid duplication. For particularly complicated patients at high risk for adverse drug events, a visiting nurse or visiting pharmacist in the patient’s home can review medications and see where pills are; they can check pill bottles, look through the medicine cabinet, and find out what they’re [patients] really taking. We can prescribe things in the office but that sometimes doesn’t bear much relation to what really happens with an older person taking drugs. AW: How can physicians effectively address a patient’s dementia earlier in the disease trajectory? Pacala: That’s a controversial topic right now. There are very ardent proponents of dementia screening, and there are other experts who are saying the value of dementia screening and early detection hasn’t been proven yet. This is one of those situations that on the surface can be a little bit difficult to grasp. What is indisputable is that dementia is greatly unrecognized in older adults—particularly early dementia. It’s underdiagnosed and unrecognized. Even outright dementia is underdiagnosed. That we know for a fact. We also know that with certain screening methods, we can detect it early before it becomes clinically apparent. What we don’t know is whether detecting it early changes the outcome or the course of the illness. That’s the conundrum right now; that’s the controversy. Some experts think it’s important to detect early for planning purposes, such as making a living will and developing a financial plan. And patients have the option of getting started on treatment early even if early treatment is not definitively proven to change outcomes. They should at least be offered that option. The other side claims there’s no evidence that detecting dementia early actually does make a difference. The message that all parties would agree on is that clinically apparent dementia is largely unrecognized and undertreated. This is an awareness issue. Healthcare providers need to be much more aware of unrecognized dementia and need to be attuned to that. Primary care physicians need to examine the issue and then decide how they will deal with it. Are they going to systematically screen their patients for cognitive problems, inquire about problems, or are they just going to set their radar at a higher sensitivity? If a patient is fumbling for words or can’t remember what they had for breakfast, it warrants investigation. AW: What measures can physicians implement to more effectively screen for and treat osteoporosis? Pacala: Osteoporosis is a classic chronic illness. It is asymptomatic for many years until something really bad happens. What happens to women—and less so to men—and happens at alarming frequency for postmenopausal women: They lose bone density for many years, but it doesn’t cause any symptoms whatsoever. Then they experience a fracture or they look in the mirror and they’re 3 inches shorter than they used to be because they’ve had three compression fractures in their vertebrae. Providers need to primarily prevent osteoporosis by addressing risk factors, such as being white or Asian, thin, sedentary, a smoker, alcohol use, low calcium and vitamin D. For a woman in her early 50s with all of those risk factors, providers should work with the patient to correct those risk factors to the extent that’s possible. Measure a woman’s bone density with DXA [dual-energy X-ray absorptiometry] scanning. It’s recommended for women to have a scan at age 65 if they haven’t already had one. Some experts recommend earlier. For example, some premenopausal women should have bone density checked earlier if they have risk factors for osteoporosis. The US Preventive Services Task Force recommends women have a DXA scan at age 65. If a patient has low bone density but hasn’t yet had a fracture, then you’ve detected osteoporosis. You’ve detected the disease process before something bad has happened. If that is the case, then you can prescribe treatment to strengthen bones and increase bone density and decrease the risk of bone fracture. For perimenopausal women, assess risk factors and treat them. For postmenopausal women, check bone density and go from there. Follow the general preventive schedule process. For providers seeing older women for a checkup, one of the things you have to look at is bone health; inquire about exercise, calcium and vitamin D intake, and ask about bone density screening. If they’re into their 60s and have never had one (DXA scan), then one is indicated. 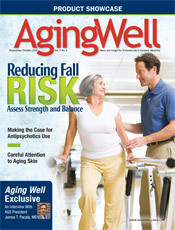 AW: How can physicians take a proactive role in preventing patient falls? Pacala: One of the most general concepts related to falls is that in older adults, falls are almost never due to a single cause. In an older adult, a fall is usually a very complex multifactorial etiology of physical conditions. Medications, treatment of disease, environmental factors of where they’re living, even social aspects can contribute to falls. A patient may take several medications, have arthritis or diabetes, live alone, be depressed, be afraid of falling, and rarely get outside the home or apartment. A series of events and factors, including physical, mental, social, and environmental—for example, flooring changes/textures, poor lighting, etc—may cause a fall. With a number of different etiologies, they’re not just medical. In looking at preventing falls, we’re not just looking at how well a patient can walk or how strong they are. We’re looking at a lot of different things. We’re looking at how well a patient is able to function. How active is this patient? Is this patient on medications predisposing him to falling? What is his social life like? What’s the environment like—the house or the apartment? Does he or she have to negotiate steps? What’s the flooring like? Are there cats or other pets? There can be a whole number of issues that can contribute to a fall. It’s important for health providers to have a heightened awareness that this is a significant problem in older people. There should also be some type of systematized way of assessing whether the patient [has fallen or is] at risk for falls. There are different instruments to do that. Once you determine that an older adult is at high risk for a fall, all of these medical and nonmedical assessment factors come into play. The workup is actually fairly involved and not simply confined to an assessment of the musculoskeletal system. AW: What is a physician’s role in encouraging Alzheimer’s disease patients to enroll in clinical trials? Pacala: It’s a physician’s role to make any patient, Alzheimer’s patient or not, aware of all their options. And with Alzheimer’s disease, what that means is working with patients and their families to provide a balanced prognosis and assessment of their illness. With Alzheimer’s disease, though there’s wonderfully promising research going on all the time, the fact of the matter is that the treatments we have for Alzheimer’s at this point are of relatively limited effectiveness. We have some medications and we have behavioral and caregiver programs that can delay progression of the illness or undesired manifestations of the illness—such as being placed in a nursing home or institutionalized—by a year to 15 months. So it can delay it, but it can’t stabilize it or prevent it. What our patients and caregivers need to do is understand what the options available to them are—both medically and behaviorally. And what the options are should they want to participate in advancing the knowledge. I think that’s the important thing. The reason a person should enter a clinical trial ideally should be an altruistic one to help advance the knowledge of the medical profession rather than a desperate attempt to get better. Some patients want to roll the dice in the hope that a drug will change the disease progression. That’s a very vulnerable position for a patient to be in, and I think that doctors shouldn’t oversell the probability that an experimental therapy will work.